The Red Ribbon is the best YA novel about the Holocaust I have read. The story it threads together is gripping, moving and important . . . deeply-researched, but wears its learning so lightly that the history is woven seamlessly into the fabric of the colourful story. I was especially struck by its sophisticated handling of the moral questions that the camps ask. More honest (and much more historically accurate) than the overly-simplistic fable The Boy in Striped Pyjamas, The Red Ribbon deserves to be very widely appreciated indeed, and I urge teachers and Holocaust educators especially to read it. * Robert Eaglestone, Professor of Contemporary Literature and Thought, Holocaust Research Institute, Royal Holloway, University of London * Lucy Adlington's 'The Red Ribbon' is a very worthy addition to the canon of young adult Holocaust novels and it well deserves its place alongside 'The Boy in the Striped Pyjamas', 'The Book Thief' and the Morris Gleitzman trilogy. I had heard of the musicians of Auschwitz before but not the clothiers although as someone who has visited the concentration camp it is poignantly ironic to contrast the mounds of clothing there with the thin striped outfits the inmates were forced to wear and as the novel shows that some were able to prolong their survival because of their dressmaking skills. Adlington does not shirk from conveying the horrors of such a place but portrays them in a sensitive manner never forgetting her target audience. She also manages to show that even in the darkest of situations compassion, friendship and humanity can never be totally extinguished. Her characters are well drawn, the prose skips along and the novel is cleverly divided into sections represented by a colour. I was particularly moved by the final part with its emphasis on hope and looking to the future without ever forgetting the past rather than on despair and retribution. This is a finely written novel about a delicate subject and one that like two of the aforementioned novels would I have no doubt translate well to the screen. * Benjamin Peel, Skegness Library * A Real Weepie * My Weekly * Lucy Adlington's read is a tear jerker. Bookworms are calling it a cross between 'The Diary of Anne Frank' and 'The Boy in the Striped Pyjama' and it's a reading list essential * Maximum Pop * In Auschwitz, teenagers Ella and Rose survive because they create clothes for the Commandant's wife. Despite the dark situation, the friends' compassion, friendship and humanity win out * Candis Magazine * A terrific read and a great story of endurance and survival * School Librarian * A sensitive and brilliantly-written look at the Holocaust * Book Murmuration * compelling, illuminating, ... and female * Notes On Paper * an engaging read * I Wuv Books * My thoughts as I finished reading the book were that I had just read an amazing book. The author has written a fictional version based on the extremely real facts that took place at the horrific prisoner of war camp that is better known as Auschwitz. This is the sort of history that should be taught about in schools so the atrocities and those who died are never ever forgotten * Jeanz Books Read and Review * For a moment, I was wondering how such a deeply harrowing time in history could be conveyed as a Young Adult story, but Lucy does this with care, sensitivity and raw emotion that is suitable and readable for any reader from the early tween years. Overall, I just can't stop thinking about The Red Ribbon ever since I closed the last page. I am truly in awe of the effort, truth and pure brilliance that Lucy Adlington has put into this novel, with these fragile and broken, yet strong and kind, characters bound together in a time where they were forced apart. This is a truly mesmerising tale of hope, sacrifice and friendship and I loved it! * Pretty little Memoirs * an affecting and enlightening read * Black Plume * Adlington's writing is beautiful and often moving. Keep the handkerchief ready * The Lady * With four strong female protagonists, this is an original tale that runs high on emotions * School Library Association * Fashion and Auschwitz may seem an unlikely pairing in a children's book, but this story is tremendously thought-provoking about the horrors of the Holocaust and the deeper meaning of clothes and the way you present yourself to the world. 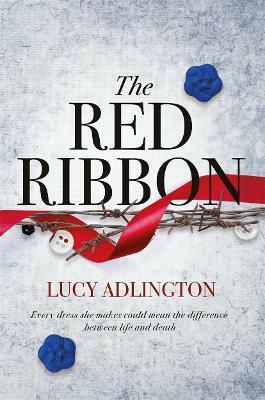 The Red Ribbon is a moving story of friendship, kindness and heroism under impossible circumstances * Booktrust * I feel that this book is a brilliant example of showing that hope and friendship is possible in even the darkest of places, even in the monstrosity that was the Holocaust, which destroyed the lives of millions of people. So, to all the readers and dreamers out there, don't give up hope. -- Grace, aged 14 There were many instances whilst reading this that I paused, my heart breaking at what I was reading, like most takes set during this time period, they are not for the feint hearted. There is a harsh reality that has to be faced, and whilst this is a fictional tale there are elements of truth to it and from reading other books it's quite easy to imagine events playing out as they did in this book. The rawness of the emotions I felt reading this are a credit to Lucy Adlington, her writing is superb and truly left me feeling so caught up in the story of Ella. * The Quiet Knitter * This powerful young adult Holocaust novel is an incredibly moving and important read that resonates with its message of hope and compassion * Culture Fly * The theme of hope running throughout the book and the sadness of that time brought tears to my eyes and gave me goosebumps. It is a disturbing, heartbreaking story - especially as it is based on true events.